It was the injury that rocked Northern California. The agony and the disappointment evident on his face. The painful limping as he struggled off. The helpless looks of his team. The question on everyone’s mind was how would they respond? Would the team fall apart without their leader? Or would they step up and do the job that was in front of them like the professionals they are? Only time would tell and, boy howdy, has time told the tale. This was a very well run, professional event that was set up, as far as I can tell, so that a proud dad could watch his son play rugby. Hey, there are worse reasons. Andy Schatzman’s son plays at Boston College and he rarely gets to see him play so he organized sponsors, a venue, media and paid the remainder out of his own pocket to bring 6 Jesuit Universities together for this event. Travel was paid for, a dinner on Friday night was arranged with guest speaker Jarrod Hayne, a BBQ lunch on Saturday and breakfast on Friday rounded out the hosting and the setting could not have been better. Let’s hope this becomes an annual event as it was well worth the price of admission. Day 1 highlights included Pelicus Pedem Referee doing color commentary for an afternoon Jordan Bruno match. After a conversion kick there was a lull in the commentary ably filled by a gurgly burp from Mr Bruno picked up nicely by the extra sensitive mikes used by Next Level’s broadcast. Segueing adroitly I commended the organizers on their BBQ during the lunch break (we hear another burp) and the play by play man Ryan Ginty quips “And the referee obviously agrees.” You have to love live broadcasts. Another Day 1 highlight: on a day dedicated to the Pope that saw almost no foul play and only one yellow for a technical violation I was given the honor of adjudicating the final Saturday match. Naturally, I had to announce my presence with authority so not 3 minutes in I had a yellow card to each team in the books for foul play. I finished the weekend leading all referees in cards. And Pat Clifton doesn’t think referees can ever win. Idiot. Day 2 highlights included more color commentary from yours truly where I renamed Boston College standout Joseph D’Antonio as “Joey Bag-o-donuts”. Play by play man Ryan Ginty smoothly went along with it and he was Joey Bag-o-donuts (with the proper Italian gangster accent) for the rest of the tournament. There was some good rugby and some not so good rugby, but all in all a great event. Loyola Marymount only travelled with 7 players and were blown out in all their matches yet had the play of the weekend in their final match when a LMU player ran towards the ball rolling on the ground and, without breaking stride, popped the ball up with his toe straight into his hands as he sliced through the defense for a try. Another great moment was during the early day 2 matches, which were try fests as teams were looking to gain or maintain a spot based on point differentials. Notre Dame scored with just seconds remaining but needed 5 more points to tie and a conversion to win and make the tournament final. With no more time on the clock they HAD to win the restart. So the kick goes up and it’s a good one. The Irish forward charges downfield and leaps, taking the ball in the air with a magnificent catch and unimpeded sprints to score under the posts. A do or die play and they did it. Amazing. This is rugby at its best. Was There Another Injury This Week? Oh yea, I almost forgot. Steph Curry sprained his knee but the Dubs took care of business against James “I should have been MVP last year because defense doesn’t matter” Harden and the Houston Rockets. I was never worried and Steph will be back for the next round. A wonderful question from A Confused Reader and a timely one, although I have no idea how this reader could have read this Hail Pelicus and yet still write in before it was published to ask a question about it. Some sort of time-twisting transperambulation of pseudo-cosmic antimatter, no doubt. In any case I would guess the answers to your questions are, in order, only a few and probably not. Maybe all of the amazing commentary and humor of the previous sections overshadow this bit. In any case, we aren’t planning to stop it so keep those questions coming! I arrived at CSUMB about noon on Saturday after a tedious drive down Highway One, with traffic bumper to bumper from just south of Watsonville through Moss Landing. After Friday’s rains the skies had become mostly sunny, and the temperature was in the mid-60’s, with a strong breeze coming off the ocean not much more than a mile from the pitch. There’s a screen wrapped around the fence on the west side, and inside the ground one would have hardly noticed the wind at all. Monterey Bay, wearing brand new navy blue jerseys that were the correct size for women, won the toss and elected to kick off to Sacramento State. By three minutes time the Lady Otters had scored the first try of the match, by none other than senior Sabrina Bacuangan, who once again darted with the ball from loose play, leaving would be tacklers behind. At 12 minutes the home team would be on the Hornet’s doorstep, scoring from a 5 meter scrum when Sabrina dotted down. Both these initial tries were converted by fly half Katy McGill, who was to do some running of her own during this match. CSUMB was very dominant this half, scoring three more tries until finally, at 35 minutes, Sacramento State scored when their number 8 picked up at the back of an awarded 5 meter scrum and bulled her way over for their first unconverted try. Before half time a tap penalty that was given to Sacrament State 5 meters out was run in for the visitor’s second try for another five points. Half time score read 31-10, and three tries had been scored by Bacuangan, whose ability to side-step tacklers has been noted throughout the season. It’s too bad she is a senior, playing in her one and only season for her school’s side. The second half started with CSUMB scoring two quick tries, and it seemed that another was on when McGill had intercepted a pass as Sacramento State penetrated into CSUMB’s quarter. This gal has some speed, as well as the ability to side-step from tacklers, and it seemed she might be running the ball all the way to the other team’s in goal when she was tackled from behind near the opposition 22. A ruck formed quickly, and the ball was picked up by a Hornet, the only one in the ruck on their side of the breakdown, who then passed it on to their number 8, who had managed to get back in support, and then had a clear path to score a try at 62 minutes, as nearly all the Otters had followed up and were caught flat footed by the turn of events. Two more tries would follow for CSUMB, the last from a lineout in Sacramento State’s quarter, with Sac State throwing in and losing, and the loosehead prop of CSUMB was able to score from play that followed. McGill converted from near the touchline out about 30 meters, and that kick might have brought the most applause from the supporters, who numbered near 100, students and parents alike. Near full time Sacramento State would score from a tap penalty that was given from 10 meters out from CSUMB’s line. Final score was a season high 48 points for Cal State Monterey, to Sacramento State’s 20. Having refereed quite a few CSUMB WR matches this season, I was very impressed by the improvement in play of their backline. McGill at flyhalf, changing position from full back in late February, has been a great difference. The ball was shifted a number of times during this match through the three quarters to the wing, and in defense their full back was able to counter attack from some kicks that failed to reach touch several times. Regarding scrum half Sabrina Bacuangan, she plans on returning to her Seattle home after graduation next month, and is thinking of continuing her rugby career up there with either the Breakers or Puget Sound. I’m convinced if she were just a few inches taller she could play rugby at a representative level, even perhaps making the Eagles, she is that good, not just on offense, as she doesn’t flinch when it comes to making a tackle. Perhaps her size will not hold her back anyway, and if there is a player who could overcome size as a handicap, she’s it. This is supposed to be a game for people of all sizes, regardless of gender. What other sport has dictated positional assignments based somewhat on body type and size? Sacramento State was sorely missed as a competitor for the majority of the season, and I’m sure they are looking forward to having a full season’s worth of matches for next year. The second half featured fewer penalties and more scrums. 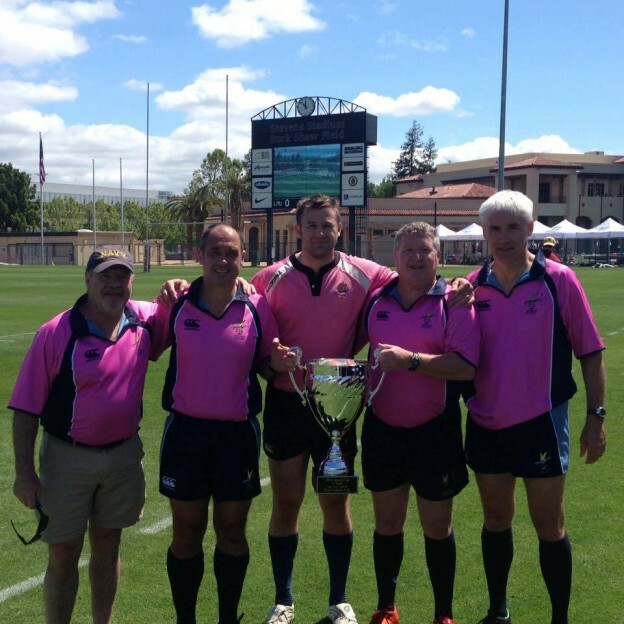 Napa scored a converted try at 19′ but Shasta was able to score a converted try at 36′. Final whistle shortly thereafter. Fans erupted from the sidelines, swarming the pitch and tearing down the goal posts. It was a beautiful day at Treasure Island with 4 championship games as well as a Premier League game mixed in, all day, top level rugby. I watched Pete Smith’s game that kicked off at 9:00 am and then got ready for my 11:00 am kick-off between Colusa and Napa. Both teams were 10-0-1 with their only tie being between them, a 36-36 tie, earlier in the season. Several players were ex-teammates. I’d reffed both teams in the last couple of weeks, so I knew it would be a battle. Luckily, I had Preston Gordon and Robert Hammack as AR’s, knowing they would be a huge help. With Pete Smith announcing and rock and roll music playing before kick off, the players were stoked and I even had goose bumps, wishing I could play (for about 5 minute), Colusa kicked off and it immediately looked “like a battle”. Hard hitting and running, fierce rucking and some good passing, it all made for an entertaining game. Napa broke through first with a try on the 14 minute mark, while playing one man down. Colusa tied it up with good, prolonged forward work at the 25 minute mark. With 5 minutes left in the first half, Napa regained the lead with some long runs and good support, scoring a diving try on the right side of the try zone. On the last play of the half, Colusa punched another one in for a half time tie. The second half began and Napa again found themselves playing one man down for repeated infringement, players leaving their feet in the ruck. Neither team scored for the first 22 minutes, until Napa found the try zone. With only a 5 point lead, it was anyone’s game until the last 10 minutes, when Napa scored again and then finishing off Colusa, who, by then, were only playing with 13 players, with one last try and conversion, with only one minute left, for a final score of 27-10. Thank you Preston and Robert and also for Lee Johnson’s feedback as my referee coach. The last game of finals day at SFGG delivered an uncompromising and entertaining tight match between 2 highly committed teams. Having won both the head to head league matches earlier in the season Life came is as the favorites but from the start it was clear EPA were in the mode to upset. For those of you who know these teams the physical contest was all that was expected but with able assistance from Paul and Giles we kept the “lid on the pot” with only a few no wrap tackles needing direct intervention and a few words. Life started the stronger having opted to play into the wind but some strong defense and the occasional unforced error left them with no reward after 10 minutes of strong field position. EPA then had a few minutes in the Life half but turn overs cost them possession. Life had the stronger scrum throughout the game and also the better lineout (neither side was helped by the strengthening Bay breeze with crooked throws frequent). But on most occasions when needed, EPA held their own possession and cleared their lines. Their No 8 did some great work at the base of a frequently retreating scrum to retain possession. Having regained the upper hand, Life finally got the score board moving on 19 minutes with a penalty from in front of the posts. This score actually spurred EPA into life and they dominated the next period of play from the kick-off. On 26 minutes after getting deep into the Life 22 on the right, they recycled possession a few times and Life infringed at the breakdown on the defensive 5m line. A quick tap was taken and the Life No 8 in an offside position deliberately tackled the ball carrier to stop the score. The penalty try was awarded and the No 8 (and captain) accepted the yellow card with no issues. The successful conversion put EPA in the lead 3-7. From the restart Life turned over possession and following a few phases earned a penalty on the EPA 10m line – given the wind against the attempt at goal was optimistic (and missed) but it did eat into the sin bin time. A long 22m restart put play back into the Life half and after a few minutes of pressure EPA were awarded a kickable penalty which was converted. EPA in the lead 3 – 10 on 31 mins. This is how the half ended although Life did have another long range penalty effort go wide. The second half started with Life dominating again and on 52 mins after some strong running they broke through for a converted try and leveled the score at 10-10. You could physically see the Life players now expecting to pull away but EPA were not in the mode to let that happen. Life continued to dominate field position with the strong breeze but EPA were putting in big defensive hits which frequently turned over possession. We passed 60 minutes with the sides locked at 10-10. On 66 minutes, after putting a number of phases together and using the width of the field EPA regained the lead with the best score of the match, touching down wide on the left. The conversion was unsuccessful so EPA were 10-15 ahead and their confidence grew. By this point multiple substitutions had occurred on both sides without the intensity dropping. Having conceded the lead, Life really looked to increase the pressure. They tightened their game plan and drove multiple phases down field – turn overs cost them possession but with the strong breeze EPA were finding it difficult to get out of their 22. On 34 minutes the pressure finally told with with one of the Life backs scoring under the posts after some really physical contact phases cleared the way. Converted and the lead at 17-15. From the restart EPA did manage to gain possession and briefly threatened through a few phases but a turn over and wind assisted kick put the m back in their own half for the last 5 minutes. Despite winning some defensive turnovers they could not get around or through the Life defense and the last couple of minutes had Life camped in-side the EPA 22 and an unconverted try with the final play of the game brought the final score to 22-15 in favor of Life. On the final whistle both teams (as usual) forgot the previous very physical 80 minutes and shock hands and bantered with both teams acknowledging the crowd and thanked the team of 3! Having questioned a decision at the end of the 3/4 playoff the young student in question approached me after the game with the phrase “I just want to explain why you are wrong so that you know for your future refereeing”. Your silver haired Pelican (who has probably been ref’ing longer that the young student has been a resident of planet earth) proceeded to explain the decision taken and our young scholar joined his team mates with a little extra knowledge of the laws of the game! EDITOR’S NOTE: Well I hope you do try to learn a little about the laws of the game if you want to keep doing this refereeing thing. After some juggling by USAR, Cal Poly was slated to host Air Force on Saturday at St Marys. Cal Poly got on the board first followed by an Air Force try. Three more unanswered trys by Air Force and one pushover scrum try by Cal Poly made the score 26-10 at halftime. Air Force is a kicking team and this game had plenty of kicks. One cross kick by Air Force led to a try, At that point Cal Poly could not recover. Cal Poly scrum was dominant the whole game, but Air Force backline was quicker and got the ball out to the wings on multiple occasions. Teams from the south and mid-atlantic were represented at our own UC Davis for the women’s DII playoffs this weekend. Salisbury from Maryland was taking on Tulane from New Orleans. Both teams seemed fit, well coached, and disciplined, and both were out for a win. Salisbury seemed to have more momentum in the first half, and they scored first going up 12-0, but they had a series of unfortunate knee injuries during the game and some of their girls had to come out. Meanwhile, Tulane scored twice in the last 11 minutes to bring the halftime score to a tie. Salisbury came out hard again in the second half, with a score in the first 5 minutes, but Tulane again fought back and tied the score up AGAIN with only 4 minutes left. 80 minutes ended too soon! So, we went into overtime (much to the excitement of Scott Wood who was very thirsty at that moment). Overtime taxed both teams with the heat and the extra exertion, and Tulane pulled off the win with some astute poaching and a few breakaways in those extra 20 minutes. Not to be cowed, Salisbury got the last word with the last try at the very end of the game. The final score did not reflect quite how hard these girls played and how close the game was overall! Climax match of season at beautiful field of dreams in Orinda foothills backing Tilden Park & Caldecott Tunnel used by Diablo to practice hard to get apparently for Saturday matches including an awesome clubhouse nicer than any other I’ve seen in the US. Diablo jumped out to a 40-5 halftime lead only to see the Brits fight back (as bomb squads do), scoring 6 2nd half tries almost all in one corner where their fullback hit almost all the impossible kicks. Then the Gaels scored another 3 2nd half tried to edge ahead. Great camaraderie at the clubhouse. Hopeful will hang out with the funny talkers today @ the Pro Rugby match in SF before they go south to play their hosts OMBAC & another match against the Old Aztecs. Sunday. This was a friendly on SMC’s front field after the men’s earlier smashing win over Air Force in the rugby stadium. The Lady Gaels were somewhat depleted-their seniors were off doing something else-but looking forward to a last match. And the Lady Broncos were pleased to give them one. Just when it seemed that Santa Clara would open the flood gates, SMC would score a couple. There were some marvelous multiphase drives down the field-one must have been 12 phases. My MVPs-the Santa Clara scrumhalf, fearless, and the St Mary’s fullback, who spent her afternoon tackling ladies 60 pounds bigger than she was. EDITOR’S NOTE: How did USC manage to win 3rd if the reported score is 0-0? Did you award the winner based on number of yellow cards? It was winner versus winner of the quarterfinals for DII women’s rugby, with Humboldt and Tulane looking to go to the national championships in a couple of weeks. I had refereed Humboldt a few weeks ago for playoffs and knew they were a strong formidable team, and knew that Tulane was also strong and well coached. Humboldt didn’t come out with their usual aggression, and they conceded 4 tries in the first half, partly due to a yellow card for grabbing the tempting braid of a Tulane ball carrier. Tulane had great defense, including a picked ball run in for 5 points. Humboldt did score early in the half, and were able to cross the line once more before the halftime whistle blew to bring the halftime score to 24-10. I expected Humboldt to make up some points in the second half, which they did. Humboldt was able to put 3 more tries on the board in the time that Tulane was only able to get 3 points from of a penalty kick. Meaning that with only 13 minutes left, there was a tie score of 27-27. Tulane answered back to break the tie a few minutes later, and put the nail in the coffin with a second score on the outside. Humboldt tried to get back in the game and actually scored with 1 minute left, but it was just not quite enough. Both teams had some excellent players, some hard hits, great runs, and the game was excellent. Thanks to all the folks at the playoffs. It’s great to have AR’s and a #4. EDITOR’S NOTE: With all of this scoring going on one would think that there was an actual final score. Apparently not. This entry was posted in News on April 29, 2016 by James Hinkin.